Need to Get LED Tube Light Safety Testing as per IEC 60598-2-1, LM-79 testing, IP Testing in India? 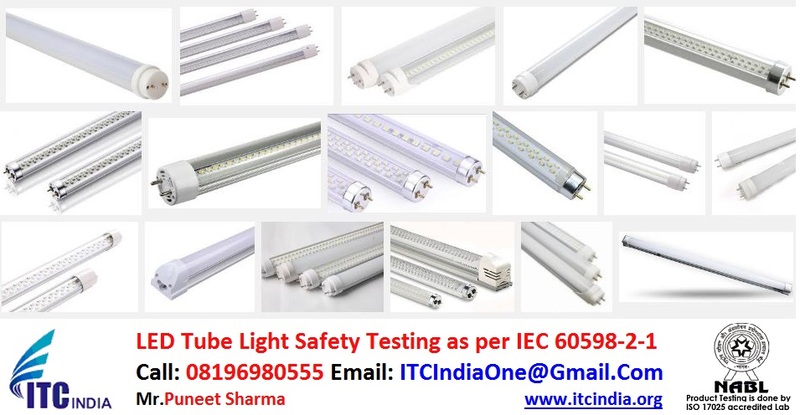 ITCIndia Nabl Accredited Electrical safety Testing Laboratory Providing LED Tube Light Safety Testing and Certification Services as per IEC 60598-2-1, if you are looking for LED Tube Light Safety Testing Laboratory in your Area, you can feel free to contact us, ITCIndia also providing LM-79 testing, and IP testing for LED Tube Lights, if you are interested, we will be happy to assist you. Luminaire suitable for direct mounting on normally flammable surfaces. Technical specification of the LED Tube Light. This entry was posted in IP Testing, LED Testing, LED Tube Light Safety Testing, LM 79 Testing, Luminaries LED Product Testing, Photometric Testing and tagged Electrical Safety Testing Lab ITC India, Electrical Testing Laboratry ITC India, Get LED Tube Light Safety Testing Report, IP 20 testing for LED Tube Light, IP Testing for LED Tube Lights, IP66 & IP67 LED Lights for LED Tube Lights, Lamps & Luminaires - EMC-EMI Testing lab in India, LED Lighting & LM-79 Luminaire Testing Laboratory in India, LED Lighting Test Method and Standards, LED LIGHTING Testing and Certification Services, LED Product Testing lab in India | Electrical Safety Testing Lab ITC India, LED Strip Water Test & IP Ratings IP68 - IP67 - IP40 for LED Tube Lights, LED Test & Measurement lab India, led testing labs in india, led tube light LM-79 test report, LED Tube Light Safety Testing, LED Tube Light Safety Testing Ahmedabad, LED Tube Light Safety Testing bangalore, LED Tube Light Safety Testing chandigarh, LED Tube Light Safety Testing Chennai, LED Tube Light Safety Testing haryana, LED Tube Light Safety Testing in India, LED Tube Light Safety Testing mumbai, LED Tube Light Safety Testing New Delhi, LED Tube Light Safety Testing Panchkula, LED Tube Light Safety Testing Pune, led tube lights test report, LED Tube Lights Testing, LM 79 Test Laboratory - LED/SSL Luminaires, lm 79 testing labs in india, lm 79 testing labs india, lm-79 test procedure, LM-79 Test Report, LM-79 test reports and luminaire LED quality and performance, LM-79 Testing for LED Tube Light, LM-79 Testing for LED Tube Light Ahmedabad, LM-79 Testing for LED Tube Light bangalore, LM-79 Testing for LED Tube Light in India, LM-79 Testing for LED Tube Light Kolkata, LM-79 Testing for LED Tube Light Mumbai, LM-79 Testing for LED Tube Light New Delhi, LM-79 Testing for LED Tube Light Pune, Panchkula - Service Provider, Safety Testing as per IEC 60598-2-1, Safety Testing as per IEC 60598-2-1 for LED Tube Lights, Searches related to LED Tube Light Safety Testing, Water Protection for IP65.